eD@HoMe: My second cover from faraway Uruguay! Today, I am happy to share with you my second cover from faraway Uruguay! 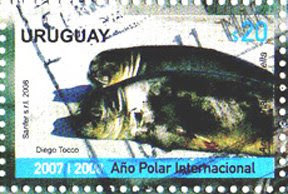 On this cover is a souvenir sheet issued in 2008 by the Uruguay postal administration to commemorate the fourth “International Polar Year” 2007-2009. 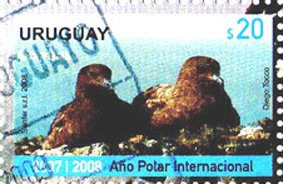 It is one of the many postage stamps issued by more than 40 countries from around the world to feature the slogan “Preserve the Polar Regions and Glaciers”. The aim of this project is to raise public awareness of the central importance of the Polar Regions in the Earth System - especially as it relates to climate change. 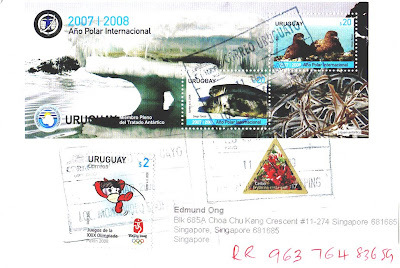 The stamp featuring the Beijing Olympic mascot Fu Wa is part of a set of 4 stamps from the Beijing Olympic Series, issued on 22th July 2008. 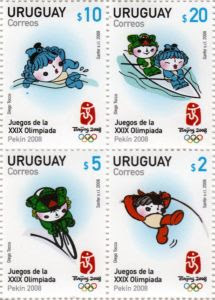 The stamps depict swimming, canoeing, cycling and pole vaulting. 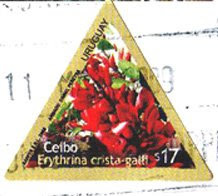 The triangular stamp on the cover belongs to the Flower definitive series. It is part of 3 flower stamps issued in 2008. This cover was posted on 11th March 2009 in Montevideo and reached me on 26th March 2009. It had traveled an estimated distance of 15,766km! The city of Montevideo is the capital of Uruguay and is located in the south center of the country. It is the only city in the country with a population of over 1 million. Montevideo has beautiful beaches, such as Pocitos, Buceo, Malvín, Playa de los Ingleses, Playa Verde, Punta Gorda and Carrasco. Many monuments and museums are found in the city, as well as historic buildings and squares. According to Mercer Human Resource Consulting, Montevideo has the highest quality of life in Latin America.